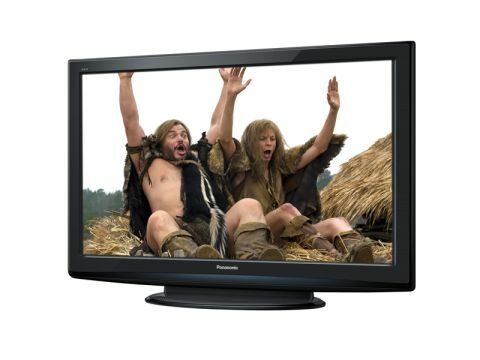 What the Panasonic TX-P50S20B 50-inch plasma lacks in svelte good looks it makes up for in strength. The TX-P50S20B comes complete with a reinforced glass 'tough panel' that can take a blow measuring four joules, which is roughly equivalent to chucking a bag of sugar at the screen from a foot or so away. Flying Wii controllers – surely this unusual feature's purpose – should therefore pose no problem. Behind that glass is a full HD plasma panel of excellent quality and speed. Tests with an Xbox 360 (in Game mode) suggest that the TX-P50S20B out-performs LCD TVs with videogames, largely thanks to a 600Hz system that is only subtly different to similar techniques used on LCD TVs, but has an altogether more impressive result. Footage from Pro Evolution reveals no trace of blur with the action lucid and immersive, with the all-new Neo PDP panel also proving itself easily bright enough to challenge LCD TVs in that department. When it comes to contrast – long plasma's trump card – don't expect the best. Panasonic does make the blackest panels around, but that applies only to its step-up models, the G20, V20 and VT20 Series of 'Neo PDP' (and the latter, 3D) panels. This 13th generation panel, which is a Neo PDP model (though not the very latest version), has a Real Black Drive system that does a decent enough job. Gloomy scenes from Pacific contain enough shadow detailing, and certainly more than a similarly priced LCD TV, while colours fly from the hi-res action. Standard-definition channels do seem soft, though they're remarkably clean, considering how far they're stretched to fit the screen. For a plasma so serious about picture quality, the TX-P50S20B does seem bereft of features. Although there is a Freeview HD tuner, Freesat HD is skipped over, as is DLNA media streaming, Panasonic's Viera Cast online TV platform and even that staple of modern TVs – the USB slot. Instead, a SD card slot is provided on the side of the TV that can play JPEG photos and DivX-encoded AVI files. Another connections-related gripe concerns the HDMI inputs. The three provided are just about adequate, but to integrate the TX-P50S20B into our existing setup we had to use the third side-mounted HDMI, which creates a bit of a mess. Although the user interface is clean enough, with the excellent remote's Viera Tools shortcut icons the highlight, the electronic programme guide (EPG) that operates Freeview HD looks a tad old fashioned. As a GuidePlus+ system, it's also blighted by advertising. Lastly, the speakers lack dynamism; there's the usual lack of low frequency sound, though in terms of volume and detail they're a step up from sound systems found on smaller sets. A considerable step up from Panasonic's entry-level X20 range of HD ready plasmas, this full HD Neo PDP telly may not reach the heights of the brand's high-end models, but it makes for a great value screen if picture quality is your primary concern.